Make Scrapbooks, NOT dinner. : I WON!!! Gerald called Nathan earlier this week and said that he and Brent were going skiing today and wondered if he would go. They were going to go to Hidden Valley in PA. He wanted to so bad, but he hates to leave the kids and I home alone for another day out of the week. I tried my best to get him talked in to it. He wouldn't budge. However, yesterday I called his mom and asked if she would keep just one of the kids today so that I wouldn't be stuck home with them all day again. Of course she agreed and when I told Nathan you could see that that had really helped him. Then last night we went to Gerald's birthday party and of course Brent was there also. They put a little (very little) pressure on him and he caved. So he left this morning at 10 after 5. They are there now. Just talked to him - says he is having fun but they haven't started skiing yet. 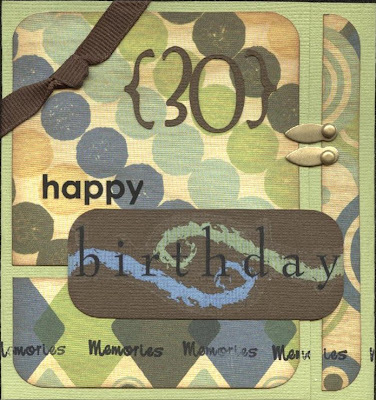 This is the card I made for Gerald's 30th birthday. Thanks for the food at The Barn, Gerald. It was delish! By the way - can I burn your CD that we got you?!?! haha He doesn't even look at this so don't know why I'm asking here. Missy and I are going to go shopping today - probably all day - or as long as we can. Mom is keeping at least one of my kids and Aunt Judy is keeping Caden. We will have a lot of fun. Pam - you know, I do make scrapbooks for other people. All you have to do is ask. I'm cheaper than most, too!! 8-) I would love to work for ya! Thanks for your compliments. Tons of luv!